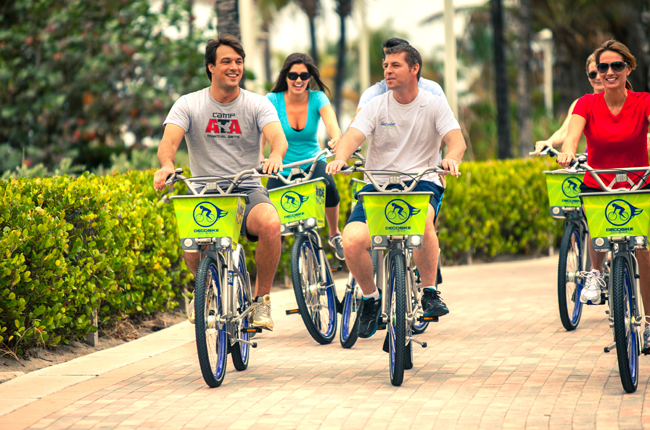 During National Bike Month, Kimpton Hotels in Florida are offering the Spin and Sip promotion. May is National Bike Month, and select Kimpton hotels are encouraging guests to explore local attractions on a Kimpton-branded public bike with its Spin & Sip promotion. During the month of May, each Kimpton Florida property—the EPIC; the Surfcomber Miami, South Beach; Vero Beach Hotel & Spa; The Tideline Ocean Resort and Spa; and The Angler—will provide guests with the top five attractions to see near the hotel all within biking distance. Guests are encouraged to take a photo, or a selfie, with a Kimpton selfie stick, and hashtag the image (#spinandsipkimptonfl) to receive a complimentary cocktail during the property’s happy hour. Local attractions range from farmers’ markets to historic homes. Among these stops are Bayfront Park, the Perez Art Museum and the Rickenbaker Causeway for those staying at the EPIC; the Oceanside Farmers Market, South Ocean Boulevard, and the Lake Worth Pier for guests exploring Palm Beach; those in South Beach can explore the Miami Beach Botanical Gardens, the Bass Museum of Art, Lummus Park and South Pointe Park; and in Vero Beach the Vero Beach Boardwalk, the Veterans Memorial Island Sanctuary, and the Vero Beach Museum of Art will be included. In addition, guests staying at the EPIC Hotel, the Surfcomber Miami, and The Angler’s can purchase a pre-packaged lunch to take on the bike ride. Rates for May start at $203 per night. All hotels offer complimentary bikes and other wellness-focused amenities such as beachside yoga, weekly fun runs with the GM, group fitness classes, spa services, and 24-hour fitness centers. For more information visit epichotel.com, surfcomber.com, verobeachhotelandspa.com, tidelineresort.com, or anglershotelmiami.com.